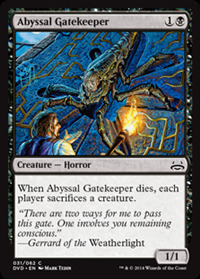 10/4/2004 The “sacrifice a creature” effect is not targeted. It can affect creatures with protection from black, for example. 4/1/2008 The player whose turn it is chooses a creature to sacrifice, then each other player in turn order chooses a creature to sacrifice, then all chosen creatures are sacrificed at the same time.